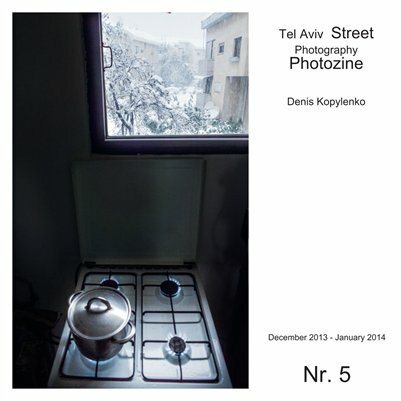 This is the fifth of the series of photozines showcasing my ongoing photography on the streets of Tel Aviv. I publish one issue each one or two months and it contains my ongoing photo work. The idea is to substitute facebook, flikr and other means of virtual life with the real stuff and give my photographs shape, substance and prolong their life. I am buy-out a small run of 20 copies and distribute them free of charge in cafes and restaurants of Tel Aviv. If you are there, you might get lucky. Otherwise, please buy a copy and help me with the expenses.